crumb-y texture. Beat the egg with the syrup, and then mix that into the dry ingredients. It’ll look like the dough will never come together – in fact, it kind of doesn’t. Just mix it as well as can, and it’ll hold together when you form the cookies. 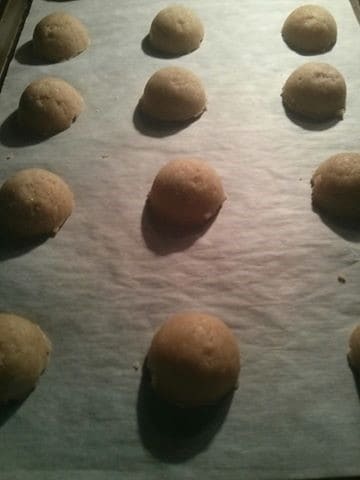 I used a 15mL measure and pressed the dough into it to form cookies. They could probably be a bit flatter, so next time I’ll press them down a bit. Bake for 14 minutes until the bottoms are just little browned. Allow them to cool on a rack to crisp up.